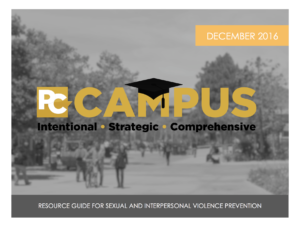 This blog post originally appeared as an article in the Fall/Winter 2016 edition of the National Sexual Violence Center‘s newsletter, The Resource. Sexual violence on college and university campuses has dominated the headlines for several years now. The work of student activists, leadership from the White House, and media in the form of documentary films, best-selling books, and too many news articles to count ha ve created major public discourse around the issue. Thanks to courageous survivors sharing their stories, public awareness has been raised about the prevalence of sexual violence on college campuses, and the troubling responses by institutions many survivors have experienced were brought to light. Recent mandates and regulations have also led campuses to take proactive measures to prevent sexual violence. Across the country, new staff positions have been created and prevention programs have been implemented. Despite this, campuses are often concerned with Title IX compliance, and many focus much of their efforts on response while little attention goes to prevention. In this environment and with the many systems, people, and opinions that make up a campus, prevention practitioners have a lot to balance. For over a decade, PreventConnect, a national project of the California Coalition Against Sexual Assault, has worked to improve our collective ability to prevent sexual and domestic violence while connecting to other forms of violence and social justice and health issues. Equally as important, PreventConnect has created an online space for prevention practitioners to connect with one another – to share knowledge, resources, successes and challenges. It has been a year since PreventConnect launched PreventConnect Campus with additional funding from the Centers for Disease Control and Prevention (CDC). PreventConnect Campus was developed for prevention practitioners working on or with campuses with the intention of creating an online space dedicated to building the capacity for campus-based prevention efforts. Including ALL campuses in the conversation – community colleges, historically black colleges and universities (HBCUs), trade schools, etc. As we move forward into this second year of PreventConnect Campus, we will continue to highlight the voices of campus-based prevention practitioners and draw on the collective knowledge of our audience. We will continue to create an online space and facilitate conversations so practitioners can learn from one another. We invite you to join us as we continue to build a community where campus prevention practitioners and community partners share successes, challenges, and lessons learned while striving to create healthy, thriving campus communities for all. Be sure to sign up for our newsletter and stay tuned for registration announcements for 2017 PreventConnect Campus web conferences. Topics we will explore include an introduction to campus sexual and domestic violence prevention, the role of athletics in campus sexual and domestic violence prevention, CDC’s HBCU Sexual Violence Climate Survey Project, and continued conversations around community colleges.